Turkish online news outlet T24 has published a letter sent by Professor Laçiner, who as of March 25 has been in prison for 610 days over alleged links to the Gülen movement, to veteran journalist Hasan Cemal, saying that he wants his previous life back. “I have worked for decades to serve my country and my people, and I’ve tried hard. I studied at the best universities in the world, and I put forward world-respected studies… In return for all this labor and sacrifice, I was not supposed to be thrown into a deep well. I am sorry and I am worried about my future, even scared. But my fear for my country is greater. It may sound strange to you, but if I fear for myself, I tremble for my country and nation. Sins committed in the past set fire to today, and today’s sins will set fire to our future,” said Laçiner. Laçiner was editor of the Journal of Administrative Studies and Review of International Law and Politics as well as a regular contributor to TRT and other Turkish television and radio broadcasts. He is also chairman of the Journal of Turkish Weekly, a regular columnist for the Star newspaper and general coordinator of Ankara-based think tank the International Strategic Research Organization (ISRO). He was appointed adviser to the Higher Education Board (YÖK) president, and in 2011 he was appointed president of Çanakkale Onsekiz Mart University (ÇOMÜ) by then-Turkish President Abdullah Gül. 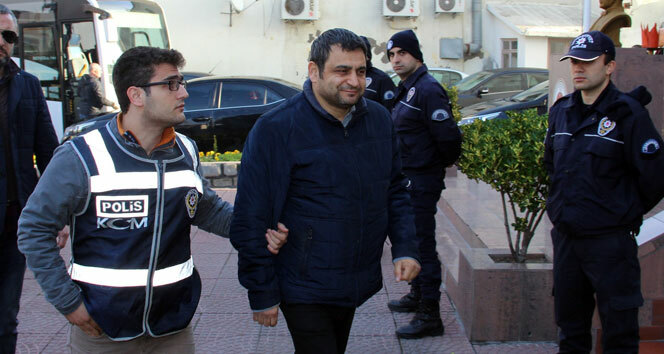 Professor Laçiner was arrested in July 2016 after the attempted coup, and a prosecutor has demanded life imprisonment for him over his alleged ties to the Gülen movement. On July 20, 2016, I was taken into custody in my home, in my work room… When the police arrived, I was working on my computer and busy writing a column for the internet (website). They turned my house upside down and confiscated my computers and mobile phone. I was arrested three days later. I could not believe that I was said to be guilty of ‘violating the constitution,’ in other words, ‘staging a coup.’ When the police said, ‘We do not know, the public prosecutor will explain,’ I waited for the prosecutor’s interrogation. On the day I was arrested more than half of the prosecutors and judges’ offices in the courthouse were empty and their names removed… If the judge who arrested me had not arrested me, perhaps he himself would have been arrested. The rooms, which are next to the office of the prosecutor who ordered my detention, were emptied the day before, and the prosecutors in those rooms had already been put in prison. I was arrested in such an environment. Later, I found out that on the morning of July 16, 2016, an arrest list was brought from a ministry in Ankara to the courthouse, and my name was among those names. Until more than two months from the day I was taken into custody, my lawyer was afraid that something would happen to him, and he couldn’t even come to visit me. The lawyer appointed by the bar due to legal obligation washed his hands of being my lawyer after a few days. I couldn’t find a lawyer for a long time. Some glitzy lawyers said, ‘We believe that Professor Sedat is innocent, but we cannot take this case; otherwise, we would be in danger, too.” The accusations were unreasonable, and the channels of legal aid were closed. In Article 309 of the Turkish Penal Code [TCK], it is a criminal offense to ‘try to abolish the order prescribed by the Constitution using force and violence…’ In the TCK’s 309th article, force and violence are essential and indispensable elements of a crime. In other words, the indictment admits that there was no force or violence in my actions and admits that there was no offense and that I am not guilty. However, it says my punishment will be to the public’s benefit. So it was clearly said, ‘Sedat Laçiner is not guilty but must be punished.’ Could there be such logic? Could there be such a law?! Another interesting point is that there was no coup attempt in Çanakkale province, where I reside. On the night of July 15-16, 2016 there was no military or civilian activity in the city where I lived, nothing related to the coup was attempted. I found out about the coup by chance on television that night. I was sitting on the balcony, and I could not believe that what I heard on the news was real. Despite the fact that my place was on a well-traveled road, there were no unusual events… As a matter of fact, the governor of Çanakkale made a statement to the Anadolu news agency on July 16 and said, ‘We are proud of our province because there was not a single coup plotter from Çanakkale. There were no putschists from our province.’ In fact, he added that there was no coup attempt in Çanakkale as well. As soon as I learned about the coup (it must have been around 23:30-00:00), I started sending anti-coup messages through social media. I have stated that coups and violence cannot be a remedy for any problems and that the public should protect democracy and the law. While I was sharing these anti-coup messages, the conflicts still continued in Ankara and İstanbul… It is an interesting coincidence that my first message against the coup attempt and the president’s first message on CNN Türk were made at almost the same time. They have been searching for months, are still searching, but they haven’t been able to find anything. I am still in detention ‘due to the fact that the evidence has not yet been sufficiently collected.’ These words are actually a confession of my innocence. They are still looking for evidence of my criminality, or I am already being punished, I have been imprisoned for years without being judged. This is called an extrajudicial execution. I have been against violence my entire life, I have opposed every kind of coup… My writings, my speeches are quite clear… I am a man who has lived all his life in a glass bell jar. I have laid all my cards on the table. In this case, I am offended to be accused of being a coup plotter while I am one who hates violence, coups, bullying. The baseless mud thrown at me offends me even if it’s slander. While I am a writer who has invited the power-holders to respect the constitution and the law, isn’t it ridiculous that I am being accused of violating the constitution? Does it not go against the grain to accuse a scientist like me who defends civil authority by taking risks in the most sensitive of periods and cursing the coup? On the other hand, during the history of the Republic, while many innocent people have been judged on accusations of violating the constitution, the real coup plotters were on the bench as judges, not defendants. You know, Celal Bayar, Adnan Menderes, Fatin Rüştü Zorlu, Hasan Polatkan and 11 other defendants were accused of ’violating the constitution’ on Yassıada and were sentenced to death. The prime minister and the two ministers who were tried on ridiculous accusations such as the baby case, the dog case, the tweezers case, were executed under the instructions of the putschists as in a theatre play. Now it’s frustrating for me to be where they stood. In the meantime, I must say that at the entrance of the hall where I am being tried, there is a sign saying ‘Theatre Hall’ (since there is no courtroom, the hearings are held in the Open Prison Theatre Hall). The Yassıada cases were a black mark on Turkish history. After 57 years, are Turkish law and politics still in the same place? Believe me, the cases in which I’m being tried are more nonsense than ‘the dog case’ and ‘the baby case’ against the late Menderes. Because in those cases there were actions of which Adnan Menderes was accused even if they were unfounded. Moreover, I am not a ruler like Bayar or Menderes, who ruled the country for 10 years. Isn’t it pushing the imagination too far to accuse an author, a scholar, a journalist like me who has no power but his pen, who has never used a weapon or been involved in a violent act, of being a coup plotter, terrorist and traitor? I asked these questions to the court, too. ‘How many times,’ I cried out helplessly to the people in the courtroom. I asked them: ‘Am I the only one to see that? Are not these accusations, arrest without any evidence, the effort to produce a terrorist from an anti-terror expert, strange?’ It has been almost two years. I am tired now. It affects my mental health negatively that while basic principles of the law are violated, the so-called people of the law who should protect them make any violation of rights seem normal and routine. It’s like everybody is crazy and it seems like my consciousness is open. The worst thing in a nightmare like this is keeping your sanity. The only case they have against me is not violation of the Constitution. Lawsuits and investigations are pouring in every day. Although I was dismissed from my job on September 1, 2016, they are constantly opening investigations. I have recently received a yellow envelope from the presidency of Çanakkale University. They found a newspaper article I had written two years ago. They inquired if I had been trying to make our state seem incompetent in that article. And they are demanding my defense of it. And so my days pass; sometimes I have to defend my articles or my speeches. One of the cases against me is about the Turkish Penal Code’s Article 301. On the order of Çanakkale University Rector Yücel Acer, who did not approve of my criticism of Turkey’s anti-terror policies, a criminal complaint was filed and the prosecutor’s office opened a case. In this case, I have to defend a column I wrote two years ago. My readers already know that I am a patriotic person. I have always maintained a stance that defends national interests, as much of a liberal as I am. If the government cannot even put up with my criticism about the fight against terrorism in Turkey, the new Turkey cannot even tolerate me. It is quite normal to be alarmed for democracy and justice, for freedom of expression and human rights. What I have been through is not merely the question of lynching or destroying an academic named Sedat Laçiner with the help of the judiciary. Through me, not only justice and freedom of opinion, but also reason is being destroyed. A terrorist, a traitor, a coup plotter cannot be derived from the nationalist and patriotic posture of a person like me who always defends the interests of this country, a writer and a scientist like me who supports the government when they do the right thing and whose criticism is always constructive and technical. I have already give up expecting them to be lawful, but at least they should be reasonable. Seeing that I have been lynched, they should be conscientious. There is logic even in a lie. When someone tells a great lie, people warn him ‘At least make it a plausible lie!’ I can respond to anything said against me. I will not dodge any discussion. But let the accusations be a little more logical, more conscientious. I have gotten used to being lynched, but there should be measure to that. Have a heart! I am also a human being. So far in my hearings, more than 300, maybe 500, witnesses, defendants and complainants were heard. Not even one of these hundreds of people had a criminal complaint against me based on evidence that was witnessed. Not a single soul came up and said, ‘I saw him with a man from FETÖ or the Gülen movement.’ I don’t even know an elder brother or an imam from the movement. I haven’t attended a single meeting. Even when the Çanakkale governor organized the Turkish Language Olympiads, when more than 40,000 people filled the stadium, I wasn’t there. I don’t have ByLock and I haven’t deposited money in Bank Asya. Not a single witness or prosecutor’s office could claim that ‘he did that,’ and they cannot since I have never attended a meeting of a religious organization. I have never been to a Quran school, either. I am not bragging by saying I have never been to a Quran course, but that is my life. My father and mother were social democrats, and my education was in secular and positivist institutions. From my primary to my doctoral education I have had secular teachers. It is also very difficult for me to be a member of a religious group, even a political party or a nongovernmental organization, because of my critical, inquisitive, skeptical, truthful character. My acquaintances know I have a rebellious character. It is impossible for me to take part in organizations where a leader’s every word is accepted as a command. The things I have written and said are the products of my own mind. I have never been connected to anybody or any group by my mind and/or my stomach. In almost two years of ongoing proceedings, the brothers, sisters, imams, accountants, sympathizers, artisans, students, businessmen and members of the Gülen movement were all heard. All this was very instructive for me. These hearings were like an obligatory course for me. Thanks to these courts, this was the first time that I have been able to learn about this organization in detail. I suppose when these cases are over I will be a distinguished expert on this structure (!). But now in charges that make no sense, I am accused of being a member of this organization, of being a terrorist and of being a coup plotter. I feel like I will lose my mind when I think about it. Can you imagine? They will check thousands, maybe tens of thousands, of phone numbers of people who called me or who I called for six-and-a-half years and see if any of them downloaded ByLock, and that would be the evidence with which to charge me. I experienced a similar situation when I was dismissed from my job at the university. They dismissed me because I was on trial, and they added my dismissal as evidence in the case. Unfortunately my counselor was right, I have paid a heavy price in prison for such a crucial life lesson. If I had listened to Professor Karsh that day and stayed in London, my knowledge, my studies would be respected and my research would be supported; at least I would not be in prison. Today I see more clearly why developed countries have developed and those who have not developed tend to stay behind. I understand much better that the key to progress is to respect scientists, writers, journalists and artists. It is said ‘Instead of an innocent being jailed, let thousands of criminals walk in the streets’ because if an innocent is jailed, that means justice is imprisoned. As far as I can see there is not one but many innocent people in prison. The periods of oppression — May 27, 1960, March 12, 1971, September 12, 1980, February 28, 1997, etc. — proved that injustice causes not only its victims but our country as a whole to lose. One reason for our being underdeveloped is the lack of justice. That’s why this letter should be considered a call for justice that has fallen behind bars and a call for freedom of speech, not as the personal and exceptional cry of a journalist and a scholar who has been prisoned for 20 months. I miss my home, my children, my wife, my friends, my students and my books… I long for all of them. I want my previous life back. I have worked to serve my country and my people. I have studied at the world’s best universities. I have accomplished things respected worldwide. The reward for all these efforts and self sacrifice should not be being thrown into a deep hole. I’m sorry and I’m worried about my future, I’m even scared. However, my fear for my country is greater. It may sound strange to you, but if I fear for myself, I tremble for my country and my nation. This article originally appeared on the Stockholm Center for Freedom’s [SCF] website on March 25.